Mother’s Day. It’s not just an excuse for Garry Marshall to point a camera at his celebrity friends and then tuck in for a nice mid-afternoon nap. It’s also a celebration of maternal love, devotion, and all the flowers and greeting cards we’re expected to buy to assure our moms we appreciate those things, really, and we’re sorry that we don’t call as often as we should. But if you need to take a break from all that corporate-mandated love and respect, the warm, welcoming bosom of TV is there for you. And those looking to latch onto the glass teat this Mother’s Day have a wide array of options available: Sundance TV, for instance, is offering up a horror-themed movie marathon guaranteed to take a hammer to all the biological clocks in the audience, with Rosemary’s Baby, Psycho, and The Others all airing back-to-back. Then there’s El Rey, which has drafted a “Switchblade Squad”—MTV’s Amy Nicholson, journalist Jen Yamato, and producer/director Roxanne Benjamin—to put together an eclectic collection of pro-mom movies that will air this Sunday. On their roster: both Kill Bill movies, Tank Girl, and Enemy Mine, the film that redefined motherhood to include Lou Gossett Jr. pushing out a baby through several pounds of latex and make-up. 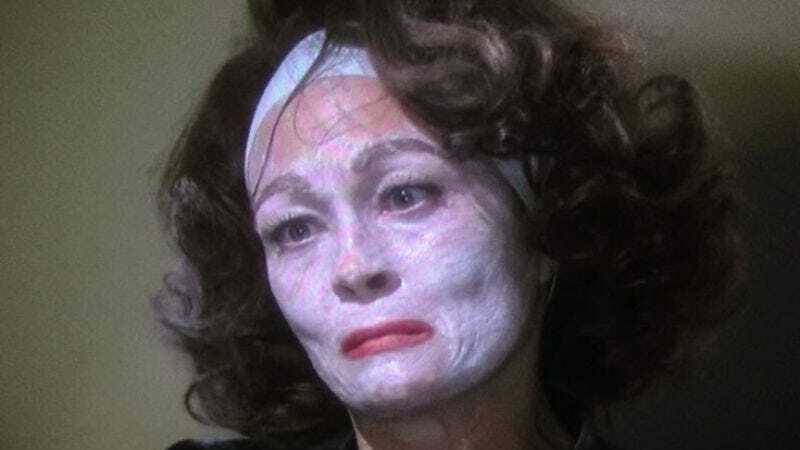 But nobody can match the motherly gusto of IFC, which is devoting 24 hours of its run-time this Sunday—from 6 a.m. to 6 a.m.—to repeat showings of Mommie Dearest. Based on the tell-all by Christina Crawford, the cult classic, first released in 1981, stars Faye Dunaway as Crawford’s mother, Joan, the patron saint of wire hanger beatings and screeching motherly rants. And while 24 hours of Dunaway going so far over the top that she eventually enters the stratosphere might not mess you up as much as it did Crawford’s kids, it does seem like a pretty good way to put whatever mess-ups our own moms made over the years into a somewhat gentler perspective.